Fruit Bonanza is a 9-line PlayNGo slot with four progressive jackpots and generous scatter wins. 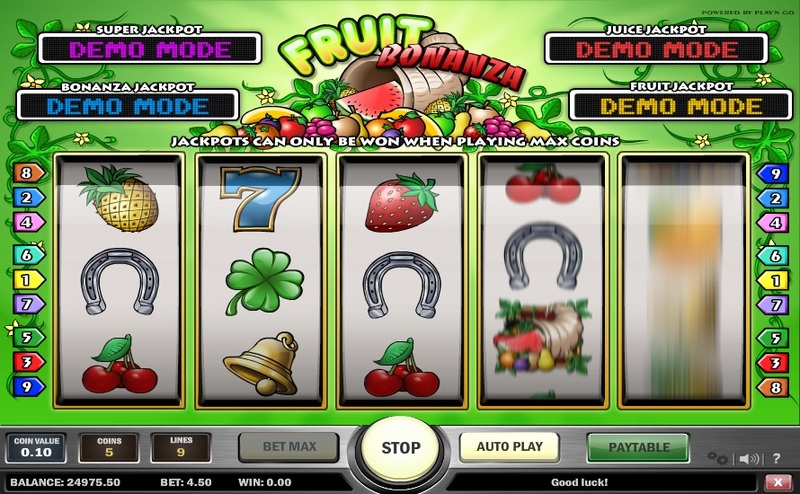 In spite of its attractive bonus features, Fruit Bonanza is based on standard slots rules. Players need to place a bet, spin the reels, and collect payouts if winning combinations of symbols appear on the reels. The slot has five reels and nine paylines. To get started, players need to select the number of paylines they would like to play. The slot has a fixed bet of $0.10, but players can bet up to 10 coins per active payline. This means that players can bet a minimum of $0.01 to a maximum of $9.00 per spin of the reels. If players wish, they can go to the game settings and turn off the audio effects. PlayNGo’s Fruit Bonanza reminds players of the old classic slots, the reels of which are loaded with symbols of sevens, bars, and fruits. The slot is based on the fruity theme, but it is not just a classic slot. If players spin its reels, they will come across icons of delicious-looking pineapples, cherries, strawberries, and oranges. There are also some horseshoes and lucky 7 symbols. The audio effects remind players of a land-based casino, the graphics are brilliant, and the ambience music is charming. Fruit Bonanza is definitely capable of delivering the ultimate slot gaming experience. Fruit Bonanza does not have a wild symbol; however, there is a special Cornucopia symbol and a scatter symbol that can help players get richer. It also cannot be forgotten that the slot has not one, but four progressive jackpots just waiting to be won. These progressive jackpots are called the Super Jackpot, the Bonanza Jackpot, the Juice Jackpot, and the Fruit Jackpot. Players can also win the top fixed jackpot of 5000 coins. If players bet max and land five Cornucopia symbols along the ninth activated payline, they will win the Super Jackpot. If the combination lands along any other payline, players will win the Bonanza Jackpot. If players land only three or four Cornucopia symbols along an active line, they will win the Juice Jackpot and the Fruit Jackpot, respectively. If players land a combination of five Cornucopia symbols along an active line without first betting maximum, they will win the top fixed jackpot of 5,000 coins. Although the slot does not have any free spins or bonus games that open on the second screen, there is a scatter symbol that offers generous scatter payouts. If players land five, four, three, or two scatter symbols anywhere on the reels, they will win scatter payouts of x400, x20, x5, and x2, respectively. With 4 progressive jackpots and a scatter prize of up to x400, Fruit Bonanza is definitely a slot worth playing.